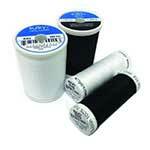 Sulky Water Soluble Embroidery Stabilisers are ideal when you don’t want any stabiliser visible after embroidering. Solvy can also be used as a topper on napped fabrics like towels to keep the loops or piles from poking through the stitching; also to prevent embroidery stitches from getting lost in any fabric, and to enhance the clarity of fine lettering and detail stitching. Sulky Cut-Away embroidery stabilisers are permanent and non-woven, ideal for knits and stretch fabrics, they eliminate pulled or sagging stitches and has excellent stretch resistance and remains with the fabric for continued stabilisation after wearing and washing. Filmoplast is a self-adhesive, tear-away stabiliser (on a paper-backed release sheet) that is ideal to use on items that cannot be hooped or are too small to fit in a hoop. Any item, particularly small items, can be embroidered easily by placing them on the sticky surface. 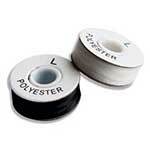 It also eliminates hoop marks on fabrics like sweatshirt fleece, velvet and brushed velour.